You are attempting to list an item(s) on eBay’s United Kingdom site, eBay.co.uk (the “U.K. eBay site”), the terms of which are with eBay Europe S.à.r.l. You are registered on a site the terms of which are with eBay Inc. You must review and accept this Cross Border Trade Agreement (the “Agreement”) before you will be allowed to list on the U.K. eBay site. This Agreement is between you, eBay Europe S.à.r.l., and if you have a PayPal account registered in the United States, PayPal, Inc.
1. THIS AGREEMENT WILL APPLY TO ALL CURRENT & FUTURE LISTINGS ON THE U.K. EBAY SITE. This Agreement will apply to any and all of your listings that you have posted to the U.K. eBay site and that are active or “live” on the U.K. eBay site, such as Good ‘Til Cancelled listings, as well as any future listings that you post on the U.K. eBay site. If at any time after accepting this Agreement you no longer want these terms and conditions to apply to future listings on the U.K. eBay site, then all you have to do is not list additional items on the U.K. eBay site. Also, if at any time after accepting this Agreement you no longer want these terms and conditions to apply to your already active or “live” listings on the U.K. eBay site, then you must end your listings in accordance with eBay.co.uk’s policy for ending listings. 2. 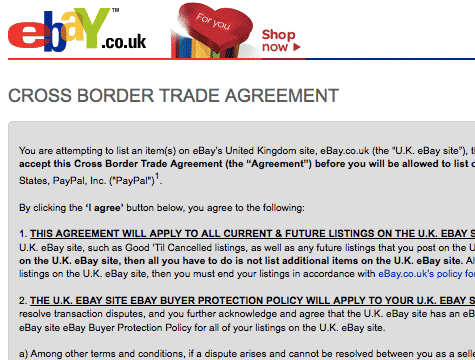 THE U.K. EBAY SITE EBAY BUYER PROTECTION POLICY WILL APPLY TO YOUR U.K. EBAY SITE LISTINGS. You agree that the U.K. eBay site has a dispute resolution process where you as a seller are required to work with buyers to resolve transaction disputes, and you further acknowledge and agree that the U.K. eBay site has an eBay Buyer Protection Policy. As a condition of listing on the U.K. eBay site, you agree to be bound by the terms and conditions of the U.K. eBay site eBay Buyer Protection Policy for all of your listings on the U.K. eBay site. a) Among other terms and conditions, if a dispute arises and cannot be resolved between you as a seller and a buyer on the U.K. eBay site, you agree that eBay Europe S.à.r.l. will resolve the buyer’s complaint pursuant to the U.K. eBay site eBay Buyer Protection Policy. b) This includes being liable to eBay Europe S.à.r.l. for any and all amounts refunded to your buyer under the U.K. eBay site eBay Buyer Protection Policy. c) The full terms of the U.K. eBay site eBay Buyer Protection Policy may differ from the eBay buyer protection policy (if any) that governs your own eBay site of registration, and you acknowledge that you understand any such differences. 3. LISTING FEES WILL NOT BE REFUNDED WHERE A BUYER PROTECTION DISPUTE IS RESOLVED AGAINST YOU. You understand and agree that if a U.K. eBay site eBay Buyer Protection Policy dispute is found in favor of the buyer and the buyer receives a payment under the U.K. eBay site eBay Buyer Protection Policy, you will not receive a refund of your listing fees. a) AUTHORIZATION TO CHARGE YOUR PAYPAL ACCOUNT You hereby authorize eBay Europe S.à.r.l., or any eBay affiliate appointed by eBay Europe S.à.r.l., to charge your PayPal account for the full amount of any money you owe eBay Europe S.à.r.l. under the U.K. eBay site eBay Buyer Protection Policy (the “Authorized Amounts”) on a one-time, sporadic, or recurring basis. b) YOUR INSTRUCTION TO PAYPAL You authorize and instruct PayPal, or any PayPal affiliate, to debit your PayPal account for all and any Authorized Amounts and to pay eBay Europe S.à.r.l., or any eBay affiliate appointed by eBay Europe S.à.r.l., such Authorized Amounts. By providing such authorization and instruction, you acknowledge and agree that in all circumstances you reasonably expect that payments made pursuant to this section are variable and may be made on various dates.You further agree that PayPal is not obliged to verify or confirm the amount that eBay Europe S.à.r.l. presents to PayPal for the purpose of processing the payment of any Authorized Amount. c) CANCELLATION As stated in Section 1 above, if at any time you no longer want PayPal to debit your PayPal account for future Authorized Amounts, then all you have to do is not list additional items on the U.K. eBay site and end all and any of your active or “live” listings on the U.K. eBay site in accordance with eBay.co.uk’s policy for ending listings. If you use a PayPal account that is registered in the European Union, this section is without prejudice to your right to cancel a recurring payment pursuant to the “Cancelling Recurring Payments” section of your European Union PayPal User Agreement. You will remain obligated to pay eBay for all unpaid amounts, and eBay reserves the right to seek reimbursement through other means. 5. YOU ARE REQUIRED TO HAVE AN AUTOMATIC PAYMENT METHOD ON FILE. You understand and agree that, as a condition of listing and selling items on the U.K. eBay site, you must have an automatic payment method on file with your eBay site of registration. 6. EBAY EUROPE S.Á.R.L. MAY RECOUP AMOUNTS OWED TO IT BY CHARGING YOUR AUTOMATIC PAYMENT METHOD. Where there are insufficient funds in your PayPal account balance or where PayPal is not your automatic payment method to reimburse eBay Europe S.à.r.l. for any amount you owe to eBay Europe S.à.r.l. under the U.K. eBay site eBay Buyer Protection Policy, you authorize eBay Europe S.à.r.l., or any eBay affiliate appointed by eBay Europe S.à.r.l., to charge your automatic payment method for any and all amounts eBay Europe S.à.r.l. paid to your buyer under the U.K. eBay site eBay Buyer Protection Policy. If eBay Europe S.à.r.l., or any eBay affiliate appointed by eBay Europe S.à.r.l., is unable to charge your automatic payment method, you agree to reimburse eBay Europe S.à.r.l. in full and in a timely manner for any and all amounts it paid to your buyer under the U.K. eBay site eBay Buyer Protection Policy. 7. YOUR LISTINGS ON OTHER EBAY WEBSITES MAY BE SUBJECT TO DIFFERENT OR ADDITIONAL TERMS AND CONDITIONS. If you list on any other eBay site other than the U.K. eBay site or your eBay site of registration, and that site or sites offer(s) its/their own eBay buyer protection policy, you agree that those site’s/sites’ policies will apply to your transactions on that/those site(s). 8. GOVERNING LAW. The laws applicable to this Agreement shall be the laws of England and Wales. 9. AMENDMENT. With the exceptions of Section 4(a) and (b), eBay and PayPal may amend these terms at any time by posting the amended terms in accordance with the relevant eBay and PayPal User Agreements. All amended terms will automatically be effective 30 days after they are initially posted. Additionally, eBay will notify you via the Messages section of My eBay. To the extent that there is any conflict between these terms and the User Agreement for the eBay site with which you are registered, including, where applicable, the eBay Buyer Protection Policy for the eBay site with which you are registered, these terms shall prevail. BY CLICKING THE “I AGREE” BUTTON BELOW, YOU ARE CONFIRMING THAT YOU HAVE READ AND AGREED TO BE BOUND BY THIS CROSS BORDER TRADE AGREEMENT. After clicking ‘I agree,’ a copy of this Agreement will be sent to the email account on file with your eBay site of registration as well as the Messages section of My eBay, where you may print a copy of this Agreement for your records. 1If you do not have a PayPal account, then this Agreement is between you and eBay Europe S.à.r.l. only.If you have a PayPal account, but that account is not with PayPal, Inc., this Agreement is between you, eBay Europe S.à.r.l., and the PayPal entity that operates the PayPal website where you registered your PayPal account.